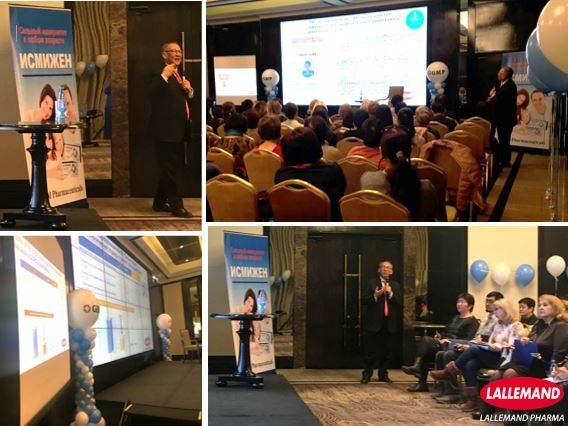 A conference on “How to manage respiratory tract infections” was organized by GM Pharma, our distributor in some CIS countries, with the presence of 160 physicians in Bishkek, Kirgizstan on February 26th 2019. The audience was composed by general practitioners, pediatricians, pulmonologists and allergologists. During this congress, Pr Giovanni Melioli (Professor of Molecular Allergy, Humanitas University of Milano, Italy), Key Opinion Leader of Lallemand Pharma, presented the rational of use and the activity of the Polyvalent Mechanical Bacterial Lysate, PMBL®, in respiratory infections. This lecture gave some highlights on respiratory tract infections and their impact on respiratory allergies, as well as the antibiotic resistance, a major public health concern. Pr Melioli also concluded on the mean to reduce the number of respiratory infections and their relapses thanks to bacterial lysates. He presented as well latest results on PMBL, and their adding-value in the management of exacerbations of Chronic Obstructive Pulmonary Disease (COPD) and Asthma. We thank Pr Melioli for his involvement in PMBL knowledge, and GM Pharma team for the organization of this conference.